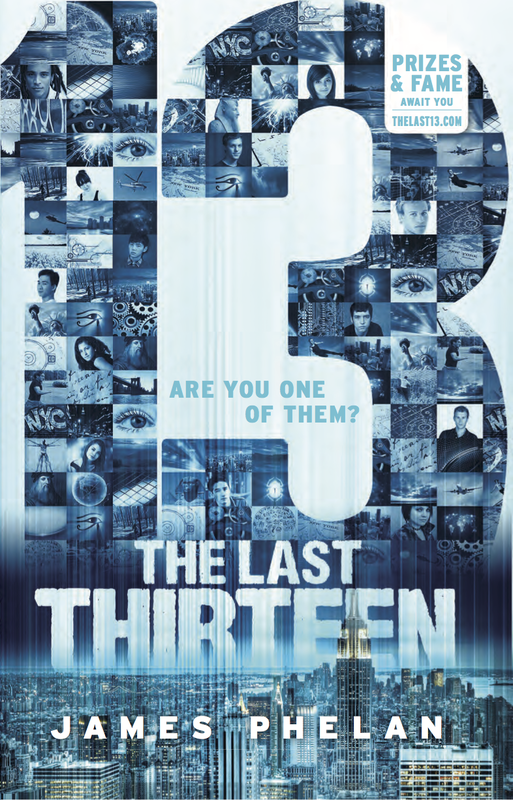 THE LAST THIRTEEN is a 13-part serialised thriller series for young readers (aimed at ages 8-15) and counts down from 13 to 1... this book, "13", is the 1st book in the series. I click my fingers and everybody dies. Sam wakes from his nightmare to discover the terrifying reality. It will come true. Kidnapped from school and finding out his parents aren’t who he thinks they are, Sam is suddenly running from danger at every turn. Nothing will ever be the same again. With his life and identity shattered, Sam’s salvation is tied to an ancient prophecy. He is in the final battle to save the world, up against an enemy plotting to destroy us all. He alone can find the last 13. Are you one of them? In 2014 the first book, 13, was voted the most popular book for Young Adult readers in Young Australians Best Book Awards, winner at the COOL kids-choice awards, named the Honour Book of 2014 in the Kids Own Australian Literature Awards, and shortlisted in the Australian Book Industry Awards (ABIAs) Book of the Year for Older Children (8 to 14 years). ​I struggle to focus on the dark, imposing figure before me. Behind, there’s a crater of shattered paving, as though it has crashed down to earth from the sky. Concrete dust coats its black full-body armour which shimmers slightly as though in a heat haze. The face is completely masked. Even the eyes and mouth are hidden behind wire mesh, the only chinks in the sleek metal facade. The whole being vibrates like it’s not completely solid. A shiver runs down my spine. I instinctively turn towards my red-headed companion, Lora. At first, I think she’s frozen like the rest of the world around us. While birds have paused mid-flight and a torn out page of a discarded newspaper is suspended in the still air, she has remained motionless, facing away from this hideous apparition. But then I realise, she cannot see it. ‘Ah, I see . . . especially her,’ the figure says, seeing my gaze flicker to Lora. It moves closer, now only ten paces away, and the mask glints reflectively as it catches the sun’s rays. The monster looks as if it’s been drawn with sharp, scratchy pen-work, like moving lines of black ink tattooed viciously onto a human shape. The sight of this being makes my eyes hurt and my head scream with its repulsiveness. ‘This is between us,’ I say through gritted teeth. Lora looks around. Her green eyes penetrating, but yet unseeing. ‘Who are you talking to?’ she asks. ‘Stay where you are, Lora, just keep looking the other way,’ I caution her, my instinct telling me to keep her away, keep her safe, even though she is much older than me. What is this thing, and what kind of hero does it think I am? I have no idea what it is talking about but then I sense a weight in my pocket. I have something important that this thing wants . . . this heavy, round object. So now I know why it is here. I reach into my pocket and retrieve a dark crystal sphere. The figure shrugs and every movement of its form leaves a slight disturbance in the air around it, a smoky haze. It’s as though I can sense a grisly smile behind the mask. Black gloved hands mime clicking fingers and I shudder. ‘Yes, that’s it, hand it to me,’ the black figure commands. I hold it out with a tenuous grip, as if it may fall at any second. ‘What are you doing?’ it says, the amplified voice more urgent. It steps towards me again and I toss the crystal up into the air. The figure moves in a blur, diving forward, reaching out for the falling sphere. I lunge towards Lora, pulling her to me. ‘Get down!’ I yell as we hit the ground. The figure grasps the crystal. As it does, it raises its other hand. Everything around us—people, cars, buildings—glows from within and then explodes in quick succession. Ash and debris fill the air as Lora begins to glow and grows warm in my embrace. I close my eyes and before she has a chance to flash brightly, both she and I are— Gone.